The first hour of our trip out of San Diego completely validated our decision to cut back on the epic road-trip through the West of the USA that was ‘Plan A’. There’s something about US freeways that freaks me out (and remember I’ve driven in Southern Italy and rural France). I think it could be because there are so many on- and off-ramps creating a constant flow of merging traffic and people changing lanes. It also might be because American drivers seem to view the wide expanses of tarmac available to them as license to move about at degrees of angle far greater than is normal elsewhere: You’ll be driving along and then suddenly a car will cut across three lanes in front of you at a 45-degree angle. Or maybe it’s because you can’t see the drivers – American drivers generally sit very low and far back in their seats so that to my foreign eyes all the cars appear to be being driven by kids. 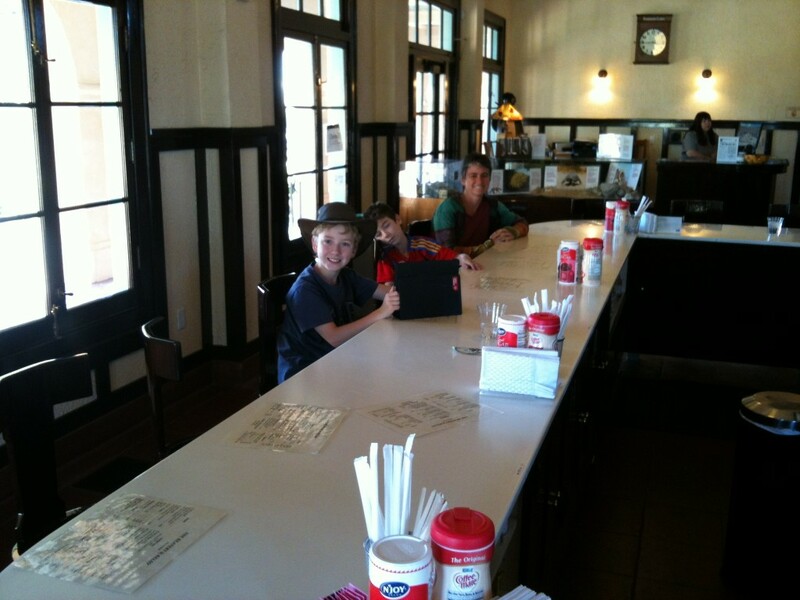 The Beanery at Kelso Depot. Whenever we are on long drives we listen to podcasts from How Stuff Works. By serendipitous chance one of those we listened to today was about why the USA is so dependent upon cars. It’s a rather tawdry story of collusion amongst the car makers, oil producers and tyre manufacturers in the early part of the 20th century. A story that has no moral at the end as the players were totally succesful and got away scott free even after their actions were called into question. The result is an entire urban architecture built to service the car. So anyway we drove out of San Diego for two stressful hours on the interstate and eventually found a McDonalds to stop in for petrol and coffee. Thanks to the free wifi we also made a lightning change to the remainder of our tour and decided to take the long way to Vegas through the Mojave National Preserve. Good choice as it turned out. 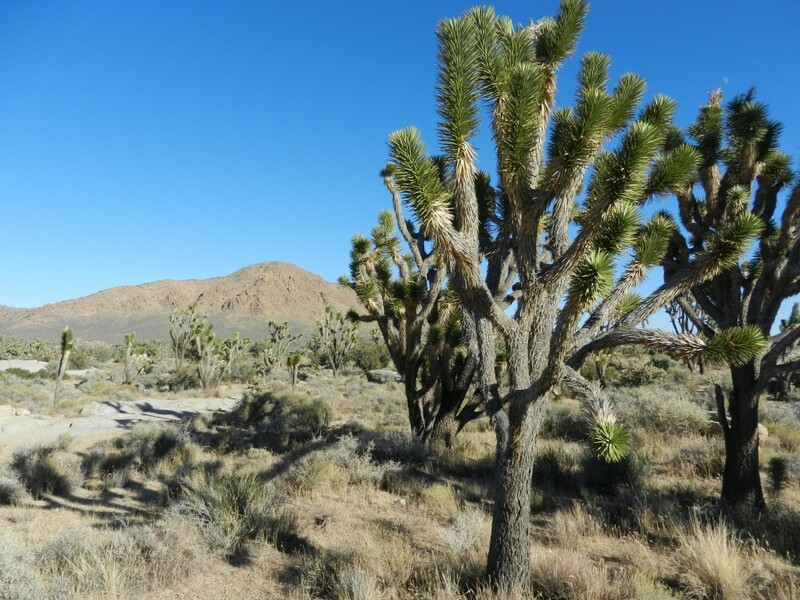 The Mojave Preserve is a lovely area bounded by four huge roads. 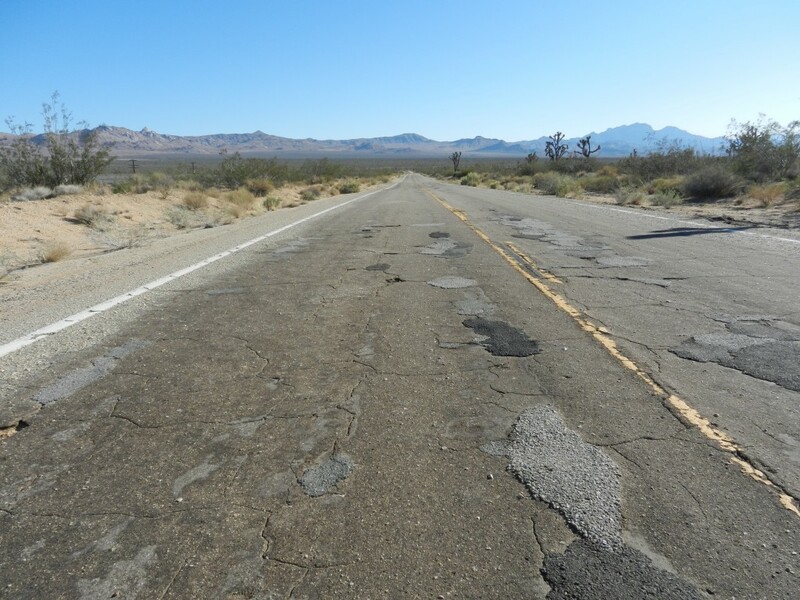 Once you leave the interstate freeways though you’re soon on a small, single-lane road that the heat has turned into a roller-coaster ride through a scrubby desert environment. Right in the middle of the Preserve is the ghost town of Kelso Depot. The town had a momentary heyday during WW2 but now has only an information centre and some picturesque ruined buildings. The information centre is also home to The Beanery which claims to be world-famous for its chile and beans. The Beanery has a restored horseshoe counter from the 1920s where we ate amazing chile followed by the best cherry pie I’ve had in years and all washed down with fresh lemonade. It’s a little like walking through a time-warp to a diner from the 50s, at least as they are portrayed in movies. From Kelso Depot the road took us further North through the largest Joshua Tree forest in the USA. The joshua tree is a kind of cactus which looks like some mad scientist’s mutant creation. It has the trunk of a tree and the spines of a cactus and grows in twisted, fantastical shapes. Seeing one outlined against the deep blue desert sky may well be a defining experience for this part of the world. But really there is no more defining experience for this part of the world than driving into Las Vegas. Billboards on all sides make it abundantly clear where you are and the delights that await you. The hotels and casinos start to loom on the skyline until suddenly you transition from desert to the quintessential first-world consumer experience. A place made possible only by the car and abundant, profligate use of electricity. Weighing Vegas against Kelso Depot with its abandoned buildings, world-famous chile and joshua trees – well, I know which one I prefer. The old post office in Kelso Depot. Yeah, Vegas could totally get skipped. When you’re picking and choosing the best of the world, I definitely wouldn’t put it on the list. I hope Death Valley is on your itinerary. As a Native Californian, I made my first trip their (as well as Joshua Tree) last February with my family. Death Valley blew us all away. We were in total awe of its beauty. 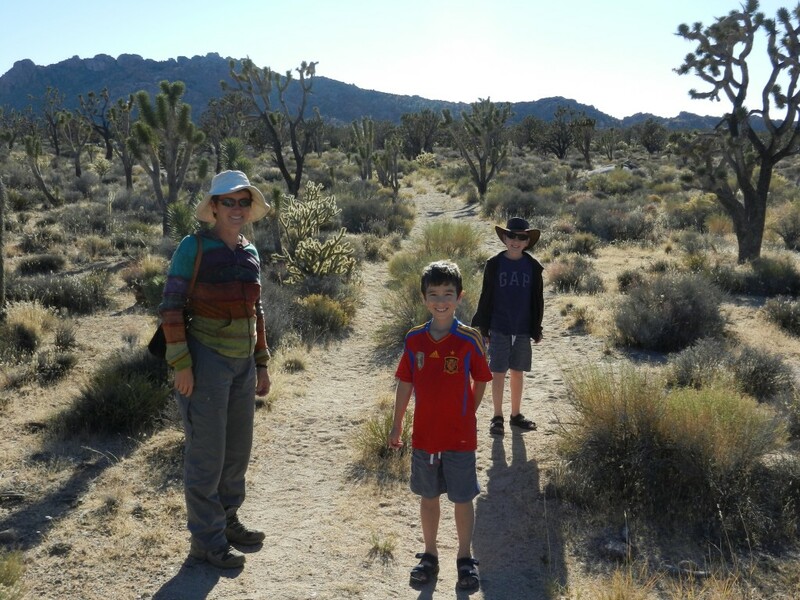 If you go, have the boys do the Junior Ranger Program where they learn all about the flora and fauna and earn a badge. The evening presentations at the Visitors Center were also great. I think it would be a nice break after the chaos of Las Vegas. Enjoy! Is that a joke? Almost anywhere is preferable to Las Vegas! 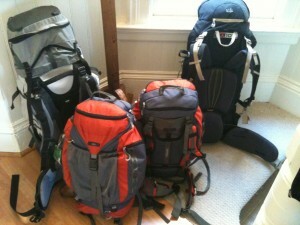 Do you have camping gear? If so you should visit Bryce or Zion National Parks, they’re so incredibly beautiful… Take care, though. Coming from a dense, urban area like Vegas it’s startling how quickly you can get out of range of human help! Or the Grand Canyon, of course.